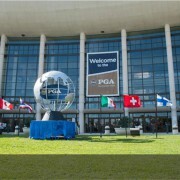 The year has started with a bang and the golf world looks to Orlando, Florida for the PGA Merchandise show, where the world’s top golf brands and key industry players converge end of January. The Tagmarshal team returns after a successful introduction in 2015 and are looking forward to meeting a host of course managers, owners and players who are looking to solve place of play issues at their courses from Wednesday 27th through to Friday the 29th at stand 2993. New product additions and price options will be introduced and the team are ready to discuss pace of play related questions and experiences and demo the solution to interested visitors. Walk on rounds (visitors) are welcome, but should you wish to book an appointment please contact Craig Kleu on craig.kleu@tagmarshal.com to arrange a suitable time slot. Leave your contact details and we'll get in touch to show you how the system and how it can add value to your course.